We were sent the loveliest handmade Mummy and Mini sandals from Beachside Stories. These are Leanora and my first matching sandals which I love. What is great is that each sandal made by Beachside Stories are designed by you, therefore, unique! You get to pick the colour and design so you can create your own story for you and your mini-me or if you are not sure on what you want, leave it to the brainchild behind Beachside Stories, Alexandra to decide for you. Alexandra grew up in Sweden but moved to London to study PR/Marketing. When her studies were over she decided to chase the sun and move to Greece in 2013. The Alexandra made her first pair of sandals for herself which caught the attention of her girlfriends and the rest is history. I have to say the sandals are super comfortable, the sole is very cushioned which is great, as at times I find after pounding the pavement all day, my feet can be achy as if you've literally been walking around barefoot all day. The beads are both sturdy enough to survive your little one jumping all over you, as Leanora at times wants to stand on my feet. The materials used to create your unique story are mostly natural stones, crystals and some metal elements to compliment the design, where she can she will always try to avoid using plastic. 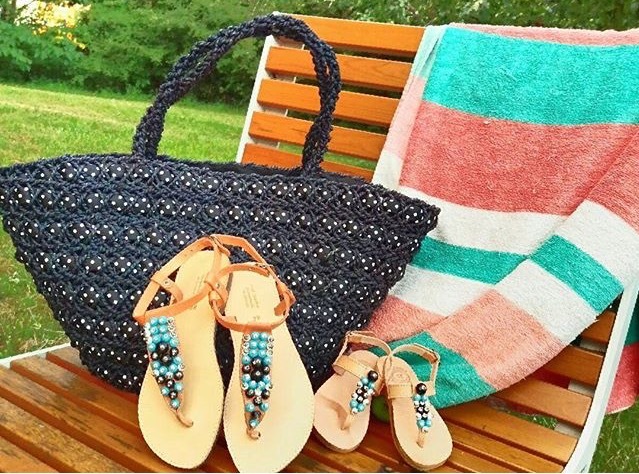 To bag yourself and your mini me a pair of these sandals you can find them at Viral Boutique in Athens, 5 Porinou St, Acropolis, Athens or you can private message Alexandra at Beachside Stories via Instagram or Facebook. 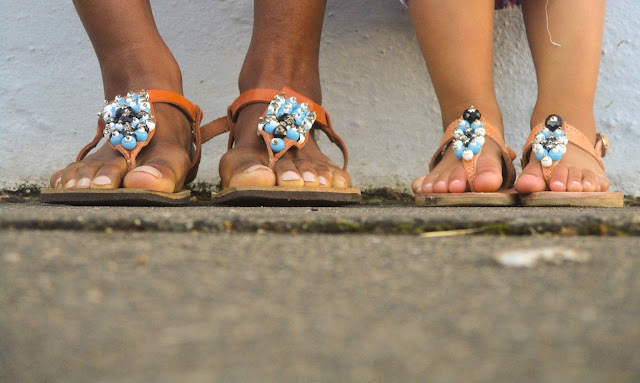 Don't forget to let us know what you think of our Mummy and Daughter sandals and let us know if you know of any other brands specialising in mummy and daughter footwear? Make sure you follow us on Bloglovin for all the latest posts and blogs and if you don't have time to go through it now you can always save it to read later, plus you can also like our Facebook Page here.